How to Simplify Your Home Office (at Tax Time!) - Home Sorted! The 2017-18 financial year is coming to a close. For most of us, this means a mad scramble in the home office to find all the paperwork required to lodge your tax return. What would you say if we told you it didn’t have to be like this? That with the right systems in place, your home office and subsequent paperwork, could be in order every month of the year. All it takes is a dash of motivation and commitment. 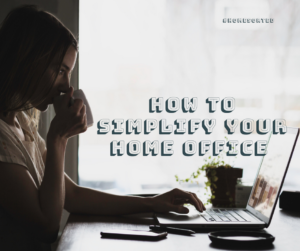 Are you willing to simplify your home office? One of the easiest ways to streamline your paperwork and or filing system is to go paperless where possible. There are a whole range of online and smartphone applications that can store (and even sort) everything you need. These include apps to file receipts for tax claims, invoicing software for those who run their own business, and cloud-based storage systems to keep previous years documents safe and secure. If you know that you have documents that have to be kept as a hard copy (paper form) ensure that these are kept in one place by creating a folder storage system. You can use plastic pockets or dividers to separate folders into different categories. All items being stored here should be actioned as soon as they enter the home office. This stops clutter from building up – and in turn, simplifies the process! With any good system, you need to dedicate time to implement it! If you find yourself having accumulated a range of paperwork throughout the week, spend half an hour to one hour (each week) actioning these documents. We recommend doing this at the start or very end of the working week. This time can be spent filing away documents, scanning paperwork to store online, or simply sorting miscellaneous bills, manuals and warranties. After all, there is no point in creating a home office system if you’re not willing to use it! Generally speaking, you must keep written evidence for five years from the time you lodge your tax return. These include records of payments you have received, expenses, assets, gifts, donations and contributions, along with disability or aged care expenses. Consider setting aside a separate area of the home office for ‘past documents’ to ensure you never accidently declutter these files.